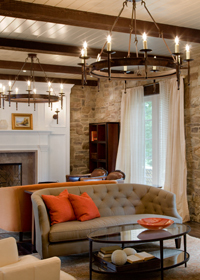 When you choose Wolfers, you join discerning homeowners, interior designers and architects who demand only the best in lighting, shading, and home automation services. Our unique lighting labs, wide selection of manufacturers, newest LED technology, ALA certified lighting consultants, and partnership with System 7 and The Boston Shade Company make Wolfers unlike any other lighting company in Greater Boston. See lighting come to life in one of our many interactive lighting labs and discover firsthand how your lighting choices work in a live room setting. Our one-of-a-kind demonstration labs allow consumers to experience the process of lighting design in a way that is hands-on and practical. Our team of expert lighting consultants will work with you personally to find the right lighting, shading, and home automation solutions for you. With years of experience, our consultants create customized lighting plans and technology designs that introduce new warmth and atmosphere to your home, office, and more—not to mention greater overall control. With our wide selection of lighting products from leading manufacturers around the world, Wolfers has something to offer everyone. At Wolfers, consumers can see extensive displays of various lighting styles, from traditional to contemporary, all in our impressive lighting showrooms. A fundamental part of the Wolfers difference is our strong commitment to greener living. We make a conscious effort to find energy-efficient lighting solutions that lead to smart and sustainable decisions. For over 80 years, we have maintained our core values of personalized service and exceptional value. From initial meetings to the process of lighting selection and design, Wolfers is your lighting, shading, and home automation partner every step of the way. This is what makes us Greater Boston’s best lighting resource for homeowners and trade professionals.